Alien space rocks are on the moon. Right now. Maybe they’ve even evolved since the 18th Apollo mission and they’re checking us out with little mini telescopes. Creepy. Well, creepier than this movie at least. No one is probably going to deny the existence of this flick is a direct result of those exploitative, cheap, and senseless Paranormal Activity duds. Who needs art when you can shovel a super cheap “found footage” feature out there and end up with guaranteed profits, right? There’s some credit sent towards Apollo 18, because unlike the ghost-y movies it’s knocking off, there’s some great art and production design here. 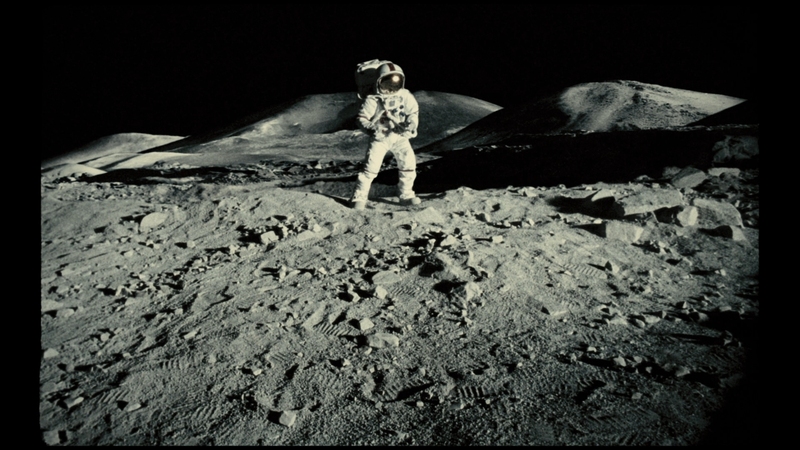 The moon is quite captivating, the use of stock footage is handled deftly, and the suits are spot-on Apollo-era technology. It can’t be said there’s nothing of value here, at least visually. Surrounding all of that work is a 70-minute dud that feels more like two hours, with two leads speaking into microphones while little alien dudes disrupt communications. All of its surprises, namely the rock critters and previous international moon landings, are rushed onto the screen just to produce, well, something. Audiences expect more from their space exploration these days, like Bruce Willis blowing up asteroids and stuff. No, Apollo 18 isn’t playing in the same league as Armageddon, nor is it gunning for a cheapie classic like Moon. Apollo 18 just sort of “is” really, a goofy sci-fi creature feature that uses a gimmick to avoid having to answer any legitimate questions. Minor stuff really, like how anything feeds on the moon, and if they just wander eating space dust, why would they care if humans pranced around? Oh, and how the government ever retrieved this footage is too ludicrous to even consider in the end. Apollo 18 was captured with 16mm and digital cameras, the latter surely to make it easier to edit the footage to make it appear aged. To be clear, by the most basic of standards, Apollo 18 looks terrible, but to further clarify, it’s supposed to. Some of the shots are filtered to look captured on tape, from the viewpoints of aging CRT monitors, or the mini-cams strapped to the suits of the astronauts on space walks. The best stuff here is the 16mm typically, the meager length of the feature giving the disc’s codec plenty of room in the realm of compression. Colors are rich, black levels are pristine, and there’s a smidgen of fine detail showing through. It looks natural, even with the sometimes exaggerated print damage. Exteriors are impossibly clean in spots, the first shot of an additional landing pod so crisp, sharp, and refined you have to wonder why the cameras on their suits can’t take images like this all the time. Err, wait. It’s because they couldn’t, but why let little details like that get in the way? Aspect ratios jump all the over place, from 1.33:1 to 1.85:1, wildly swapping around depending on how this was put together. Interlacing artifacts are common, especially with motion and from various “styles” and viewpoints. It’s almost certainly a source issue/intent considering how rapidly it comes and goes. Whatever the case, the purpose of Apollo 18’s loopy cinematography feels intact here, even if it’s rarely HD caliber material in the first place. Like the video, Apollo 18’s audio is intentionally tainted to date it backwards a few decades, not to mention place it with lesser equipment that was simply meant to work. Dialogue is never crisp or pristine, merely audible. Countless lines come through radios which further dampens the quality to complete the effect. When it has a chance though, this DTS-HD mix never really comes through. The launch of the rocket itself is deadened in the low end, offering no impact to speak of. Creatures slam into the hull of the pod with a barely noticeable thump, and the surrounds feature a minimalist echo. Short of some eerie creature calls that swirl around early into the piece, this one might as well be center focused. Tons of stuff was deleted, extended, or captured in alternate form, enough to fill 20-minutes worth for the special features. There are alternate endings too, four of them, to sort of solidify that Apollo 18’s idea wasn’t nailed down all that well. Director Gonzalo Lopez-Gallego and editor Patrick Lussier offer a commentary to round off slim bonuses.